There was jubilation in Ado Ekiti, the Ekiti capital on Monday following the victory of Gov. Kayode Fayemi at the Ekiti State Governorship Election Tribunal, sitting in Abuja. However, the former Deputy Governor and candidate of the Peoples Democratic Party (PDP), Prof. Kolapi Olusola-Eleka insisted that he won the poll and rejected the judgment. He said he would appeal the outcome. The News Agency of Nigeria (NAN) reports that the jubilation led to street processions and traffic gridlock across major locations in the state capital. This occurred despite an earlier police order, banning all forms of protests and demonstrations across the state as a measure to forestall possible public disorder. NAN also reports that members of the ruling All Progressives Congress (APC) in the state trooped out amidst drumming and dancing. The broom-wielding party members danced from different directions, carrying placards and singing victory songs to God, the governor and the party. 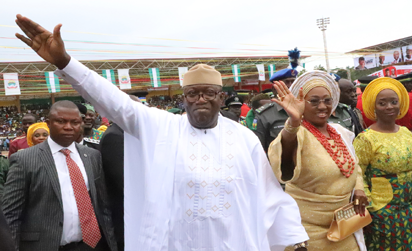 The party supporters moved from the popular Ajilosun street, along Ikere Ekiti Road, and Odo Ado area to the Government House and later ended their procession at the party’s secretariat, located adjacent to Fayemi’s political campaign office. The APC members were led by a House of Representatives candidate for Ekiti Central Federal Constituency, Mr Sola Fatoba and the Senior Special Assistant to the Governor on Mobilisation, Mr Tunji Ogunlola. Ogunlola, who addressed the crowd, said Fayemi had worked very hard to win the election and that the judgement had confirmed the position of the party. Also, State Deputy Chairman of APC, Mr Sola Elesin, said the victory was expected. Elesin said the party perpetrated no electoral fraud in the election to warrant the nullification of its outcome, as demanded by the PDP and its candidate. “It was clear that Gov. Fayemi won fair and square, so we were not afraid even if they want to appeal the judgement. “We are also ready for them, because we have no skeleton in our cupboard. There were no cases of electoral malpractices. “We had won two litigations since Fayemi came on board. He was taken to the court on his eligibility to contest the APC governorship primary and he won. “He was taken to the election petition tribunal, he also came out victorious. However, while reacting to the judgment, Prof Olusola dismissed the outcome, saying the party would appeal the judgement. Olusola, who spoke through the Director of Media of his campaign organisation, Mr Lere Olayinka said “That was not the last bus stop as regards the election petition tribunal. ”We are surely going to appeal the judgement because we know we won the election”. NAN reports that the tribunal, in its judgement delivered by Justice Suleiman Belgore, had said that Fayemi was validly elected in the July 14, 2018 governorship election. The tribunal took the position contrary to what was being canvassed by the PDP’s candidate, Prof Kolapo Olusola. It said that Fayemi polled a total of 197,459 to defeat Olusola, who scored a total votes of 178, 022 to emerge first runner-up.